Craig Fowler looks back at the sublime and the ridiculous from the latest Scottish football weekend. Who’s hot: Hibs fans are nervous about facing Raith Rovers in the play-offs and with good reason. The Kirkcaldy side are undefeated in their last 11 matches, which includes games against each of the top three. In fact, they’ve lost only twice in their last 17, both of which came against Rangers. It’s probably no coincidence that Ryan Hardie being absent from those two games played an impact on the final results, as the signing of the Rangers youngster on loan really seems to have transformed Rovers’ campaign. Before his capture they were heading nowhere, now they’re unbeatable. The addition of Aidan Connolly from Dundee United has helped also and it’s possible that the youngster will pass his old club on the way up the Scottish league structure this summer - which would be the latest in a seemingly never-ending series of kicks to the nether regions for the United support. Who’s not: For United fans at Dens Park last night, it must have been like someone literally wrote out their worst nightmare and then charged them £25 to see it. But then, with results going against them, including their own capitulation against Hamilton last week, it was hardly surprising. There was a time when United looked like a decent side who’d just forgotten how to win, as they continually threw away games. However, in recent weeks their performances have become increasingly poor and the only startling thing about last night’s result was that it took Dundee 94 minutes to take the lead. Can’t miss: Leigh Griffiths took his tally to 39 for the season, 30 of which have come in the league. Aside from the break-out performance of Kieran Tierney, he’s been the real shining light for Celtic this campaign. While his team-mates have contributed to a somewhat mediocre campaign - well, as mediocre as it can be when you’re going to win a league title - Griffiths has had a tremendous individual performance. 30 league goals is a better mark than any player has achieved since the 2005/06 season when Kris Boyd did with while banging them in for both Kilmarnock and Rangers, while the last player to do it with one club was Henrik Larsson in 2003/04. As an aside, Griffiths taught John Souttar a football 101 lesson at the weekend. Mainly, if the opposing team’s best player is having a quiet game, it’s best not to wind him up by holding on to his leg for a weirdly long time after the two of you become entangled. He’s just more likely to do this as a result. Couldn’t score to save himself: Here’s a terrific statistic on the profligacy of United’s strikers this season. Henri Anier, Darko Bodul, Mario Bilate, Robbie Muirhead, Edward Ofere, Riku Riski and Florent Sinama-Pongolle have scored two league goals in 40 combined appearances this season (according to the Evening Telegraph). What’s great is that this writer can remember both those goals without doing any digging: Ofere’s side-footed finish last night and Anier’s raker in the first half of their 2-1 loss at Motherwell. Great Escape: United should have taken inspiration from one of their former centre backs who completed the greatest of great escapes to keep Brechin City in League One. Darren Dods’ side, having sat well adrift at the bottom in February, won eight of their final 10 games to go from certainties for relegation to finishing in seventh place, three points clear of the relegation play-off spot. Maybe Tannadice chiefs could give Dods a phone call. Play to the whistle: Hamilton had a couple of close decisions go against them in the opening 30 minutes of their game against Kilmarnock, but each of them might not have been so egregious if Accies didn’t stand around both times with their hands in the air waiting for the referee to intervene. 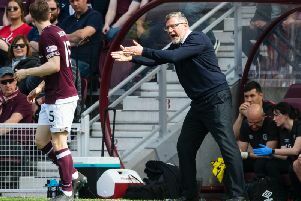 This was particularly true of their second, as Lucas Tagliapetra looks over to the assistant referee when Greg Kiltie is only two yards away from him baring down on goal. Also, if you stop the video at the point Kris Boyd makes the pass, it’s pretty easy to see Kiltie is level and therefore not offside. Downed tools: This has really been the year for teams reaching their objective and then going into full ‘holiday mode’ for the remaining games. Dunfermline went from carving everybody up to winning only two of their last five, while East Fife failed to win either of their last two games, despite the final contest coming at home to bottom placed East Stirlingshire. However, at least those sides have the excuse of their seasons being all but over. Rangers and Peterhead, on the other hand, still have competitive games to come. Rangers will meet Hibs in the Scottish Cup final, yet they’ve made their supporters very nervy about that tie with zero wins in their last four league games, while Peterhead will go into the play-offs having lost five games in a row, all of which came after Dunfermline won the title and Peterhead realised they couldn’t drop any lower than third. Top goal: Jonny Hayes shows off his blistering pace to accelerate away from two Motherwell players before squeezing the ball through the legs of Connor Ripley. Top assist: It’s got to be Kane Hemmings. While he’s insistent he didn’t touch it, it’s highly likely that United would have cleared the header if he didn’t fall into the back of the net with two of his opponents, and he was offside when Kostadin Gadzhalov’s header was initially knocked towards goal. Top save: Zander Clark made an outstanding stop to deny Jonathan Franks after the Ross County midfielder’s effort deflected off Steven Anderson in close proximity to the keeper. Despite already hitting the deck, Clark showed great reflexes to get his arm to it, halting a sure-fire equaliser and preserving Saints’ win.